Cristina Pronello, a research scientist working at UTC-Compiegne, was invited by the “So Mobility” workshops, April 5, 2018, to present her “Mobilité Dynamique”, an “app” enabling measurements of multimodal transportation, developed in a partnership with the Oise department public transport union (SMTCO) and UTC. In fact, the idea initially came to be in Italy end-2015. The lack of ‘regular’ mobility studies, deemed too expensive, encouraged the Greater Turin authorities (with some 2.5 M inhabitants), in the Italian Piedmont region, to consider the possibility of accessing real-time movement data to help them make appropriate ‘traffic’ planning decisions. In her capacity of Chairperson of the Piedmont transport regulation authority, Cristina Pronello chose to think about setting up a data collection platform, to access, and analyse data about urban mobility, the data coming in from various sources, via a mixed and specific method of approach based on a set of quantitative and qualitative factors. 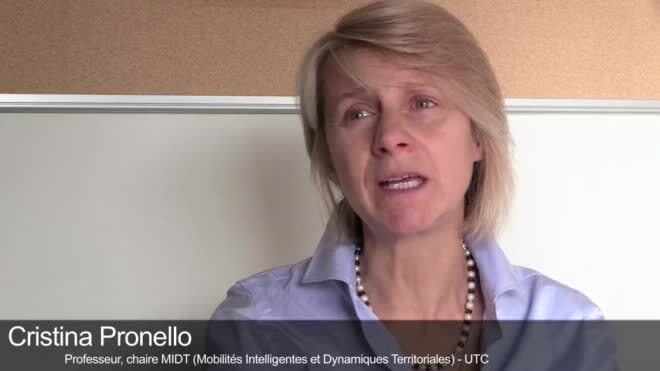 The method developed by Professor Pronello aggregates open data, from the local Navigo Pass net and even from Internet ‘tweets’ (although the latter are of little use inasmuch as they are not geolocalised), from transport operators’ sensors (Transdev and Keolis) and she decided to launch a specific “app” called “Mobilité dynamique”) for Android and IOS Oss, which records (with the user’s agreement) mobility data. The ‘app’ can follow foot, vehicle, bike, train or bus trips. All the user needs to do is activate the Smartphone’s GPS option. To obtain a higher degree of data reliability, each move can be notified in real-time. Cristina Pronello collects the data on a single server station where they are analysed, processed and displayed in chart and/or map formats … once the data have been processed, we get a better understanding of transport behavioural dynamics. It is an innovative approach which, in the long term, will allow us to coherently and optimally organize various transport modes. This can lead to pinpoint needs and to concrete implementation, e.g., a new bike lane. Now titular holder of a Chair in Smart Mobility and Territorial Dynamics at UTC, Prof Pronello is using her platform in applications for Compiegne, Beauvais and Creil cities and their suburbs, all in the Oise Department. A “living lab” was created to collect the opinions of users via on-line questionnaires via groups of reflection. In Italy, this polling consultation saw over 4 000 contributions and a thousand person registered with the Living Lab and took part in face-to-face meetings to exchange as to their needs. The investigation led to a classification of users into one of three categories: opportunist neo-Luddites (often technophobic), then the neo-classics (each representing 25% of the population) and the “hedonists” (technophiles and ecologists) representing the other 50%. “My objective”, explains Prof Pronello, “is to educate users, making them aware of their personal behavioural patterns and to encouraging them to change. Change here will call for ‘education in mobility issues’”. But we must remain pragmatic and seek an associate economic model which so far has no existence. Multimodal solutions, as she sees it, are expensive and not used much. People tend to know their ‘routes’ well and are not ready to believe in alternatives, except when there are transportation strikes.